Harshul Sanghi is a veteran venture capitalist with over 25 years of operating experience and a proven track record in delivering financial returns and strategic value. Harshul has a keen sense for the disruption of traditional industries by digital platforms – media, telco, commerce, and financial services. Harshul has consistently been ranked in the Top 20 Global Corporate Venture Capitalists by Global Corporate Venturing Magazine and has been featured in the Harvard Business Review and The New York Times. He is Managing Partner at American Express Ventures, leadingthe company’s Silicon Valley presence and overseeing global investment activity across American Express. 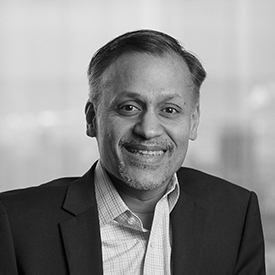 Harshul has led investments in and is currently involved with the boards of Bill.com, If Only, Instacart, Intacct, Kiip, Learnvest (acquired by Northwestern Mutual), RetailNext, Savingstar, Boxed, Tradeshift, Simplee, and Abra. Harshul has a bachelor's degree in Computer Science from the University of Oregon and and an MBA from the International Institute for Management Development (IMD) in Switzerland.